So it’s actually ‘Best of’ Nr. 7. Not to worry, any new Matt Bianco album is a good album, and thanks to Amazon it was inside my CD player within seconds of being released. The tasteful cover informs us that it’s a mix between re-recordings of the older (=eighties) and newer (90 +) tracks, 18 tracks in total. With other words’s it’s an update of the A/Collection, which attempted the same feat in 1998. Well, that was 12 (bummer, I’m old) years ago and as I said before, there’s always room for another version of ‘Half a minute’. Well, maybe not this time. While HiFi Bossanova was a brillant reboot of almost J.J. Abramsian proportions, this is a mixed bag. It starts well enough with the title track of the last album and the rebooted ‘Lost in You’, but things sag a bit. The eighties staples ‘Get out of your lazy bed’, ‘Yeh Yeh’, ‘Don’t blame it on that girl’, ‘Dancing in the street’, ‘Good times’ and ‘Half a minute’ all suffer from some degree of muzakisation. Whether this is due to the rather uninspired drumpatterns or synth sounds that sound like something from 1994 or the sparse arrangements is unimportant, but these re-recordings don’t match the originals (or even the A/Collection). Just when you want to email Mark Fisher and complain, ‘More than I can bear’ blows you off your feat with a very contemporary reworking of this classic that sounds even better than the original. The two remixes of ‘Half a minute’ and ‘Wap Bam Boogie’ are equally excellent. So, it’s a mixed bag: Some good stuff, some excellent tracks, some not so good. Should you buy it? Of course you should. It’s got a nice hardcover, has smiling Marks on the front, three killer tracks and the rest is still excellent music for the car. ← Moving from the Mac to Ubuntu? Generally I think this is a stronger offering than the a collection, and I think the rerecordings are great – all tracks taken from mb onwards sound as if it’s the original samples but slightly tweaked – noticeably the bass sounds and percussion add -ins. The wsayo stuff is updated more. Surprised why ‘our love’ represents a greatest hit when ‘fire’ would have fitted nicely. Incidentally depending on which country you live in depends on what version of ‘lost in you’ you get. I bought the Swiss cd, couldn’t wait for uk release and it had the original version ( think it was gran via album ?). I initially thought that there was some sampling going on as well. In the end it doesn’t matter, as the drum patterns and bass programming sund like something out of a elevator. But then he goes and does something amazing like ‘MTICB’. WHy not that daring approach to all the songs? Some stuff sounds like he just switched on an old Casio and recorded Reilly on top of it. I guess I’ll keep on looking for the originals then. 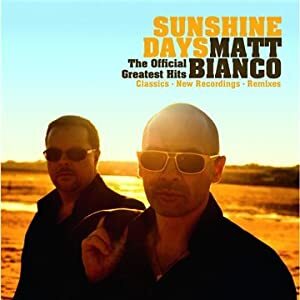 I have only heard the self titled Matt Bianco album (the second I think?) that I picked up on vinyl for 99 cents somewhere. My absolute favorite from that album is “more than I can bear”. I don’t think I’d want to hear Matt Bianco as a “contemporary” or current band. They were always retro, even in the 80s. Thanks for the helpful review. ‘more than I can bear’ is actually from the first LP and made it onto the American release of the second album without Basia’s trademark harmonies. I would encourage you to try all of the MB albums if you can get your hands on them. TO start with I would suggest ‘Rico’, Gran Via’ and certainly Hifi Bossanova.